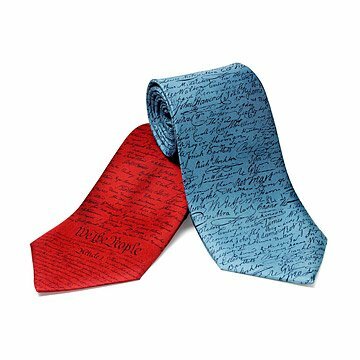 Celebrate America with these silk neckties featuring the signatures of the nation's Founding Fathers. Celebrate America with these silk neckties honoring the nation's most treasured documents. The tie at left features the signatures of the wise men who drafted the Constitution, and the rightfully famous three-word phrase that begins the document: "We the People." And the tie at right has the signatures of the Founding Fathers - those who "pledged to each other their lives, their fortunes and their sacred honor" in signing the Declaration of Independence - including Jefferson, Adams, Franklin and - of course - John Hancock. Created by New York designer Josh Bach, each design is printed on fine, imported silk and then hand finished. Made in New York. Ok tie - TERRIBLE PACKAGING & MAILING!!! I have never purchased a SILK tie that had "Stretchiness" to it! Not sure it's 100% silk. Could not BELIEVE how the company packaged this tie! It came in a small flat envelope and tie was folded 4 times!! Creases in 4 different places! I will now have to send the tie to the cleaners and have the creases steamed out! Ties were nice, and I opted to pay extra for a gift box-- and though the box was very nice, not appropriate size for a tie. The ties are silk and should lay flat, but the box is too short so they were curled up on both ends. Not a good display and not great to keep them wrinkle-free. They are also wrapped in a plastic material, makes them look cheap. There's no information included with the ties to indicate the quality and/or any info about the artist who made them, etc. That would be nice with quality ties like this. This tie is great and my husband loved it, being a history teacher and all. The color is great and true to the picture. The only complaint is the horrible packaging it comes in. It's literally just slipped inside a thin piece of clear plastic and then shipped in a yellow bubble wrap envelope. I had to search for a box to put it in when i gave it to him but even then it was not as I had hoped it would be. Please send this out in a tie box or something equivalent for future recipients! Got this tie to wear with a white herringbone button-down shirt with french cuffs, patent navy heels, red skinny belt, and navy pinstripe skirt. It's a men's tie, so it's super long on me (I'm 5'6", size 2). I found an online tie tying video and managed to get it tied the way I wanted (big and asymmetric). Now I just put it over my head and tighten it. Can't wait to wear it on Sept 17th, the day the Constitution was ratified! This tie was bought for my very politically active and civic minded nephew for his graduation gift. He loved it...put it on immediately...right over his tshirt and shorts! I agree with some of the other reviewers on the shoddy packaging...looks cheap in comparison to the niceness of the tie. I'm still very happy with the gift! I just draped it over a book about leadership and it made a nice statement. product is great, but sender needs to provide a box. It comes in a piece of plastic and tie boxes are not the easiest boxes to come by. I had to settle on a non-tie box and it diminished the excitement and presentation of the gift. Searching for a special gift that could be delivered at the last minute for Father's Day, Uncommon Goods really came through! Beautiful wrapping, too. Got both ties for my husband as a gift. They are perfect for him- a total American history buff. I have never seen anything like these ties. He absolutely loves them and wore them right away. The ties are beautiful, were delivered in good condition. I did take them out of the plastic sleeves that they came in, and found a box suitable for gift giving. Most appropriate for a hill lobbyist.